There are a few legal issues that we’ve seen consistently become hurdles for entrepreneurs and their lawyers. While in some cases they will simply be a hassle to clean up in a financing or an exit, they often have meaningful financial implications for the company and, in the worst case, can seriously damage the value of your business. We aren’t your lawyers or giving you legal advice here (our lawyers made us write that), but we encourage you to understand these issues rather than just assume that your lawyer got them right. In this final chapter of the book, we will briefly cover Intellectual Property, Employment Issues, State of Incorporation, Accredited Investors, Filing an 83(b) Election, and Section 409A Valuations. 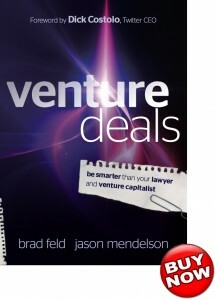 We hope you’ve enjoyed the overview of Venture Deals: Be Smarter Than Your Lawyer And Venture Capitalist. If you have, grab a copy of the book. We are open to any and all feedback, including topics you wished we had covered, things that aren’t clear, and things you disagree with. Regardless, we hope we’ve helped you be smarter than your lawyer and venture capitalist. There is another type of term sheet that is important in an entrepreneur’s life—the letter of intent (LOI). Hopefully, one day you’ll receive one from a potential acquirer that will lead to fame, riches, and happiness. Or at least you’ll get a new business card on heavier card stock. Typically the first formal step by a company that wants to acquire yours is for it to issue a letter of intent. This sometimes delightful and usually nonbinding document (except for things like a no-shop agreement) is also known as an indication of interest (IOI), memorandum of understanding (MOU), and even occasionally a term sheet. As with our friend the term sheet, there are some terms that matter a lot and others that don’t. Once again there are plenty of mysterious words that experienced deal makers always know how and where to sprinkle so that they can later say, “But X implies Y,” often resulting in much arguing between lawyers. We’ve had LOIs get done in a couple of hours and had others take several months to get signed. As with any negotiation, experience, knowledge, and understanding matter. The LOI negotiation is usually a first taste of the actual negotiating style you will experience from the other party. To keep things straightforward, we are going to focus on explaining the typical case of a two-party transaction between a buyer and a seller, which we’ll refer to as an acquisition. As with many things in life, there are often more complex transactions, including three or more parties, but we’ll save that for a different book. As we enter the home stretch of the book, we spend some time talking about financings at different stages of the life of a company. Not all financings are created equal. This is especially true when you factor in the different stages that your company will evolve through over its lifetime. Each financing stage—seed, early, mid, and later stage—has different key issues to focus on. Regardless of how much you know about term sheets, you still need to be able to negotiate a good deal. We’ve found that most people, including many lawyers, are weak negotiators. Fortunately for our portfolio company executives, they can read about everything we know online and in this book, so hopefully in addition to being better negotiators, they now know all of our moves and can negotiate more effectively against us. There are plenty of treatises on negotiations; however, this chapter walks through some negotiation tactics that have worked well for us over the years. Although this book is primarily about financings, we’ll talk about a range of negotiation tactics that you can use in your life, and we illustrate some of the different types of characters you’ll probably meet along the way.